In the previous episode of The CW’s Charmed, an electricity demon stole the Scythe of Tartarus, and we discovered that Parker was Alistair’s half-human, half-demon son. Charmed season 1 episode 8 began with the Charmed Ones chasing after the demon that took the Scythe. The electricity demon escaped and used the Scythe to release someone. The Charmed Ones summoned Charity, who would work with Mel and Harry, while Maggie and Mel were busy with their work. When Mel went to Charity and Harry, they explained that the Sarcana would say anything to recruit her. Harry told Mel that the Sarcana had used Fiona, Charity’s younger sister. Harry and Charity had a relationship that fell apart after her sister died. Jada saved a woman from a mugger when Mel couldn’t do anything to stop it. Mel went home and summoned Charity. She took Mel to meet the rest of the Elders, who were disguised for their protection. They wanted her to join the Sarcana. When she found the secret door, a witch knocked her out because she almost saw Fiona. Macy immersed herself in her job. Even when Dr. Wagner encouraged her to go home, she stayed behind to continue working to keep her mind off her loneliness. Even though Galvin and Summer broke up, the protection ward on him was still in place. However, by the end of the episode, Macy called Galvin to meet her for drinks, so they could start over. But when he was on his way, a car hit Galvin. Maggie attended a recruitment event. Whoever got the most people to download the dating app, AptitudeMatch, would get a summer internship in Chicago. When she told Parker, he was disappointed and suggested they hang out for the summer instead. Macy was also disappointed and concerned about what they would do when they needed the Power of Three. Alistair wanted Parker to get Maggie’s plasma, and his shapeshifter brother, Hunter, tailed Parker to ensure his success. On their date, Parker told Maggie he needed a plasma transplant. She unquestioningly agreed and took Macy with her, and they both donated their plasma. People who had used the dating app were going missing. After finding exoskeleton fragments, Mel and Maggie realized a cicada demon was mating with people they found on the app and laying eggs in them. They would be food for when the cicadas hatched. Unfortunately, Maggie had gotten Macy to download the app. After her date, she woke up, trapped in a sticky, web-like cocoon. Maggie, Mel, and Harry went to the AptitudeMatch office and found Macy and the other victims. The cicada queen attacked, and they vanquished her. What did you think of about Charmed season 1 episode 8? Let us know in the comment section below! 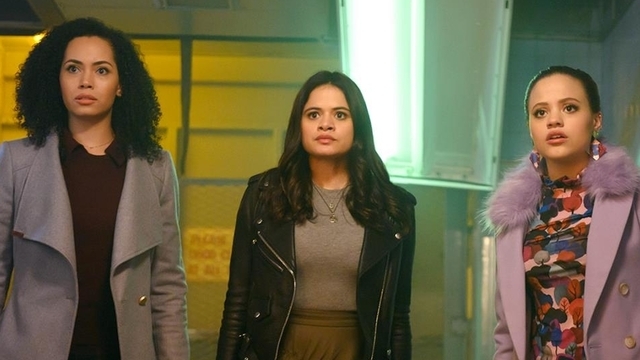 The post Charmed Season 1 Episode 8 Recap appeared first on ComingSoon.net.